Get out on the water during the second annual Keep The Broad Creek Clean Festival. Conservation is written into the DNA of Hilton Head Island. From the time the first shovel full of dirt was pulled up in Sea Pines, the island has been developed in a way that works with nature, respecting the ecological wonder we call home. For the most part, the world paid no mind to Beaufort County during the first half of the 20th Century. The little bit of industry that was here arose from nature: logging, farming and fishing. Then the German behemoth BASF came along in the 1960s and proposed a chemical plant on Victoria Bluff on the Colleton River. That changed everything. It rallied the residents, fishermen and a development in its infancy called Sea Pines Resort on Hilton Head Island. The coalition, called Friends of the Rivers, stopped the plant. Residents and businesses have remained vigilant ever since. It is an act of faith to run into the ocean, not knowing what mysteries await in its depth. Walking the dog after sundown can quickly become an adventure if the right creature crosses your path in the dark. Even the benign-looking world of the salt marsh hides its secrets in billowing green cord grass; you have to get eye level to the marsh in a kayak to find the clues. In short, there is much we do not know, and much to discover. On the fast track to success in the corporate world, Bill Eberlein earned his bachelor’s degree in accounting and economics from Penn State University, worked as an accountant and later moved into the field of information technology. In1999, he came to Savannah for a job at Gulfstream Aerospace — and found a new interest in some of his new home’s local residents. “I met a group of divers at Gulfstream who talked about shark teeth and I remember thinking, that's the dumbest thing I've ever heard in my life. Why would anybody dive for those tiny teeth?” Eberlein said. But his co-worker brought in a megalodon tooth and he was hooked right away. “I just wanted to find one,” he said. If you’re reading this, it means that it’s after June 1st, the official beginning of hurricane season. Being from Florida, the season, which ends on November 30th, is something that is not just noted like the coming of summer, it’s a time that in my mind, I consciously recognize and develop mental notes towards being prepared. 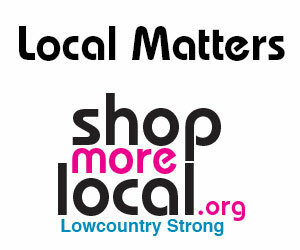 I have discovered that, for longtime residents of the lowcountry, the mindset, however, is totally different. Matter of fact, the expectation of a storm actually coming this way was so low, (and I do say was) that the consensus had some people taking the storm (and their preparations) very lightly. Until it was time to evacuate. Hilton Head Island’s ocean views and wetlands look stunning in the dwindling light of sunset — linger later and you'll have a pure view of the moon, thanks to the island’s strict lighting rules. Why don’t we get the blues in Hilton Head? Oceans cover more than 70 percent of the earth’s surface, so perhaps this is why we’re drawn to the ocean. Cities seem to cluster near them and for landlubbers, it has a magnetic pull for vacations. If you’ve visited the Caribbean or west coast beaches, you may wonder why we don’t have the deep blues seen elsewhere. At first glance, the rehab center for marine turtles at the South Carolina Aquarium on the Charleston Harbor appears to be a collection of large kiddie pools littering a basement storage room. Look more closely, though, and one can see that inside each of the 12 or so blue fiberglass tanks is a sea turtle in different stages of rehabilitation. Most are wandering around the tank, going this way or that, and coming up for air every so often. It may be hard to believe there are still wild spaces left in Beaufort County, what with Hilton Head Island’s resort polish, Bluffton’s up-and-coming downhome charms and the city of Beaufort’s historic structures. Even Daufuskie Island, defined by its isolation, has golf courses. But just behind Daufuskie you’ll find a chain of nine islands whose untamed forests and 360-degree views of pure “uncivilization” let you breathe in the Sea Islands that once were. Most people think of manatees as lazily floating about the waterways of Florida. But each spring, these docile creatures get the urge to travel. Their search for cooler waters brings them north, with many making Beaufort County rivers and estuaries their summer homes. Some migrate as far as Cape Cod, until fall and winter temperatures send them back to Florida’s warmer waters.